VICTORIOUS is a power metal band from Germany, signed to Massacre Records. The band has just announced that they will launch their new work, “Heart Of The Phoenix”, on January 13th 2017. The album was produced and mixed by Lars Rettkowitz (FREEDOM CALL) at KR Music, and Mastered by R.D. Liapakis (MYSTIC PROPHECY, DEVILS’s TRAIN) at Music Factory/Prophecy Studios. Since its formation more than a decade ago, the group has already released 3 studio albums, of which, "The Awakening" and "Dreamchaser", have received good reviews in all relevant magazines. "Heart Of The Phoenix" is the fourth record and also marks the band's third international release. The new album showcases the band's strengths: strong melodies, heavy and fast rhythms, and sharp vocals. The band has released "Empire Of The Dragonking" lyric video in November 2016, and the "Hero" video clip in December 2016. “Hero”, with a short slow violin intro, we are catapulted right into speed metal, with power riffs and incessant drumbeats. The choruses throughout the whole album are perfectly timed, and the pitches harmonized perfectly. This tune has one of the best solos of the album. 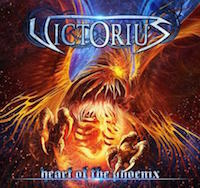 “Heart Of The Phoenix”, the album’s title track, has an uplifting beat, fast paced, and with good changes in cadence. The guitars have simpler riffs here, but captivating as well, through their riding rhythms until we get to the classic scale solo. “Empire of DragonKing” enters immediately with a very epic sound, with orchestration, completing the atmospheric guitars to bring us inside a fantasy world. The breakdown chorus is a great strength of this song, giving it force and diversity. The album is an easy listen, although it is not bringing any originality in the genre, its plain power metal in all its classic appeal. The songs are fast paced, musically well constructed, and the choruses are appealing and make you want to sing along.